Usually about once a month a customer will ask us, what industrial crane scale do you recommend? Now sometimes they will add the additional comment that usually goes something like…. under $500 or under $200. Honestly, when you start out looking for an industrial crane scale below $200, there isn’t much “industrial” about the choices available. When we think of industrial crane scales, we typically think of scales like the Intercomp CS1500 crane scale. With large, easy-to-read display, CS1500 high performance crane scales are available in a range from 500 lb (250 kg) to 20,000 lb (10,000 kg), are NTEP certified, and boast best-in-class battery life. The scales come standard with RFX™ Wireless Weighing Technology enabling cable-free control and monitoring of scales. If you need really large weighing capacities you can jump up to the Intercomp CS3000 crane scale. When folks ask what industrial crane scale do you recommend? Another choice that sometimes seems appropriate is the Intercomp tension link. The TL-8500 tension links are cost effective, wireless, overhead load management machines! Lightweight, Compact Design for Cranes, Riggers, Shipyards, Construction Sites, Surveyors, Inspectors & Utilities. When working around overhead loads or near line tensions, accuracy and safety cannot be compromised. The Intercomp TL8500 Series Tension Link scales are becoming the industry standard for verifying, controlling and monitoring overhead loads and line tension while helping to maintain a safe work environment. These tension links, with a self-contained LCD display, are machined from aircraft-grade aluminum with shock-mounted electronics in a NEMA 4x/IP65 weatherproof enclosure. Intercomp’s Tension Link scales are built to last in capacities ranging from 500 lb (250 kg) to 300 tons! TL-8000 Tension Link Scales feature fully Integrated RFX™ Wireless Weighing Technology. For applications where viewing a display at the link is not feasible or protection from extreme elements is a must, the TL8000™ Tension Link scale is designed with all of the functionality of the TL8500™, but comes standard with HH400™ (IWH) RFX Indicator, as an alternative to the built-in display. These tension link scales are lightweight, feature compact design for Cranes, Riggers, Shipyards, Construction Sites, Surveyors, Inspectors & Utilities. When working around overhead loads or near line tensions, accuracy and safety cannot be compromised. TL™ Series Tension Link scales from Intercomp are the industry standard for verifying, controlling and monitoring overhead loads and line tension while helping to maintain a safe work environment. One more industrial crane scale that we should mention is the CAS Corporation CASTON 2 industrial crane scale. 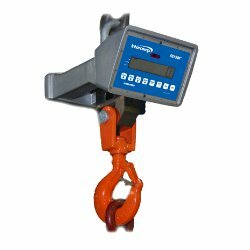 The Caston II is a popular crane scale with many customers as well. Did we answer your question, what industrial crane scale do you recommend? We hope so! If you’re in the market for industrial crane scales, these are some of the models we would recommend for most applications. If you need a little assistance, please contact our customer service for some additional buying advice. We appreciate your business!